Enhance night time sleep patterns and increase muscle growth with the most advanced Anti-Catabolic Deer Antler Formula from pure solutions. Other Ingredients: Rice Flour, Purified water, 25% organic grape alcohol. Directions for Use: Shake well before each use. Take before bed time. As a dietary supplement: Hold 30 drops in mouth for 90 seconds per dose. Sleep, are you truly taking full advantage of your recovery time? No matter how hectic and long your days are, getting proper rest is crucial for muscle growth and repair. You can train day and night in the gym but without sleep your results will come to a halt. Get your sleep back on track and start seeing noticeable improvements in and out of the weight room! Nighttime by Pure Solutions is an Anti-Catabolic sleep aid formula designed to promote deep R.E.M sleep. Being catabolic can be an athlete's and bodybuilder's worst nightmare. Good quality sleep is just as important as proper training and diet. Lack of sleep can also cause cortisol levels to raise as well. Increased Cortisol levels lead to excess body fat and decreases in muscle mass. This advanced formula supports muscle growth by assisting the body in its release of natural hormonal compounds. 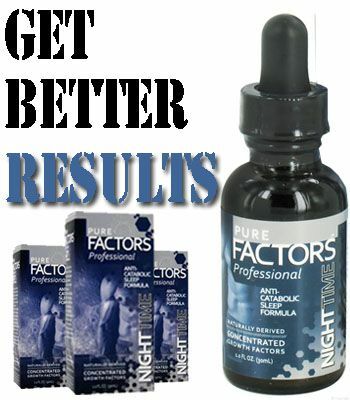 Pure Factors Nighttime halts cellular breakdown, which will help increase lean muscle mass and reduce body fat. Experience the benefits of true recovery with NightTime by Pure Solutions. Get it Now! What are the benefits of using Deer Antler Velvet? Recovery - Deer Antler Velvet has shown to be beneficial in recovery from workouts and injuries. Anti-Aging - Due to the presence of high levels of IGF-1 and IGF-2, Deer Antler Velvet may aid in the reduction of stress, enhancement of memory, recovery from injuries, and increased energy. Muscle Endurance - Deer Antler Velvet has been shown to a useful anti-fatigue agent, and research suggests it can aid in the recovery from anemia. Libido and Health - Deer Antler Velvet has been claimed to be helpful in keeping blood pressure and cholesterol levels under control as well as help maintain cardiovascular health. Improved Immune Function - Studies have shown that Deer Antler Velvet helps build the immune system and has often been used as a tonic in korean culture. The statements on this website regarding all dietary supplements have not been approved by the Food & Drug Administration. These supplements are not intended to diagnose, treat, cure or prevent disease. Before beginning any new supplement program, please consult with your physician.